When I was growing up in this county, Hotel la Rose did not enjoy a good reputation. The hotel was derelict and a home to derelicts, and Railroad Square—I don’t think it had that name when I was a teenager—was that part of Santa Rosa west of the freeway where you didn’t go if you were young and female, unless a lot of people were with you. The Spouse informs me that during his summer jobs as ambulance attendant/driver, he made occasional pickups at Hotel la Rose, mostly for men dealing with the consequences of untreated diabetes, or crazy and raving drunk—or sometimes both. Their nickname for the whole area was “Wino Park.”The building, with its thick basalt walls, the faded paint and the dark windows, was forbidding. Anyway, Niemann brought Hotel la Rose back into prominence, and sold it in 2003 to the hotel group that I think has it now. It looks like they specialize in period hotels. The place had a restaurant called Josef’s up until about a year ago, but the executive chef—that would be Josef—retired and is now the executive chef for Meals on Wheels. That’s how things go in this county. A new place called Ironstone opened last week. In the 90s and the oughts I visited la Rose twice. Once, I met a consultant there for a breakfast planning meeting. She said she always stayed there. 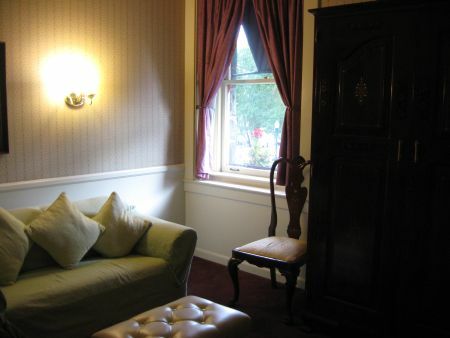 She stayed in the Carriage House, which is directly across the street from the original building. “So peaceful and quiet,” she said, with its roses and the koi pond. Yes, and so expensive. I had coffee and sat in a wing-back chair that tried to absorb me. The dining room was pretty but I felt out of place. Several years later I went to the same room in the evening for a retirement reception. I stood near the door clutching a glass of club soda, snagged a couple of Chef Josef’s gourmet nibbles, and felt out of place. Times change, and we get older. And some of us make more money. And some of us like the handcar regatta and have developed a strange taste for Victorian hotels. And I seem to be one of us. Since I decided to wear my Victorian costume to the regatta, I thought that I would stay overnight at the hotel to save my feet, and also to have a place to change out of the costume if it got too hot. I stayed for two nights. This, by the way, was extravagant. How extravagant? Very. I’m not sorry I did it, though. The lobby does a great job of looking period-like without overdoing it. Erica, who was working the desk, was helpful and friendly. I said I was mainly there because of the regatta. She said they had two other people staying because of the regatta (last year? None). While she was printing out my paperwork, Valentin joined us. He wore a black suit and a dark brown hat, maybe a fedora. Valentin looked middle-European or a bit gypsy-like to me, and I hope that doesn’t offend him. It’s a good look. He and Erica were funny and helpful. Erica gave me my key and directed me upstairs to the second floor, Room 24. I didn’t know then that there is supposedly a haunted room, room 42, or I might have asked to stay there. Or, maybe not. There is supposed to be a ghost of a little boy who rides the elevator. His name is Daniel. I didn’t encounter him, but I never took the elevator. My room—rooms, rather—seemed quite unhaunted, unless you wanted to count the noise from the eager volunteers directly below my window in Depot Park, setting up for the regatta. This, by the way, was not a nuisance. It was a bonus! 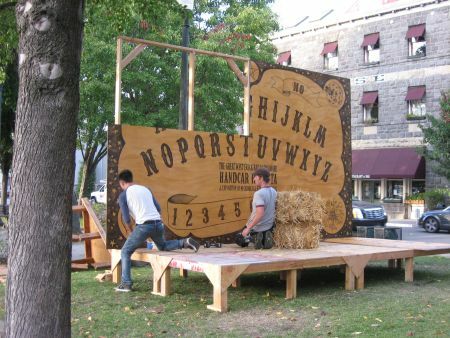 I watched them assemble the stage I called the Ouija Stage, the main stage for musical performances. While I leaned on my windowsill, peering past the geraniums, a woman, walking down the sidewalk from Fifth street, started yelling at the workmen. “You guys! You guys! I told you!” she yelled. I thought she knew them. “I told you!” They both looked up, then went back to work. I was thinking, oh, dear, they promised her a ride and they forgot, or something. The two workmen continued to drill and pound nails, and a few minutes later she went away. 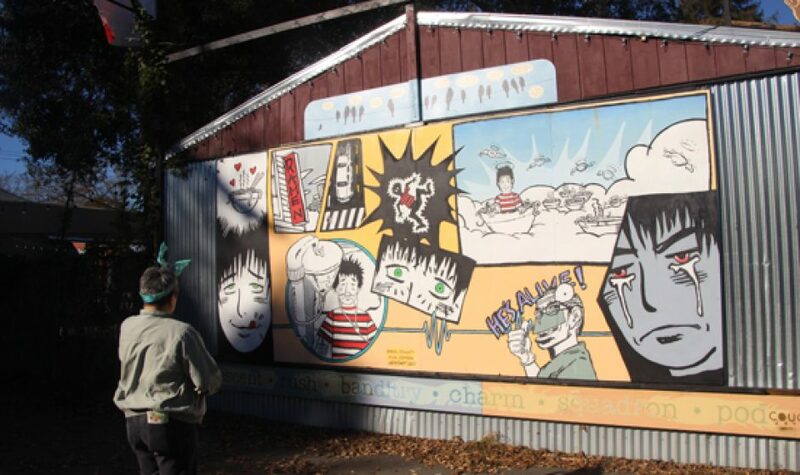 Railroad Square is still a regular meeting place for many homeless people, and an encounter with someone who is. . . unsettled?. . is practically de rigueur. Back for a moment to my rooms. What I had was basically a suite, which I really appreciated. I wasn’t aware of doing anything special in order to get that when I made my reservations on the website. 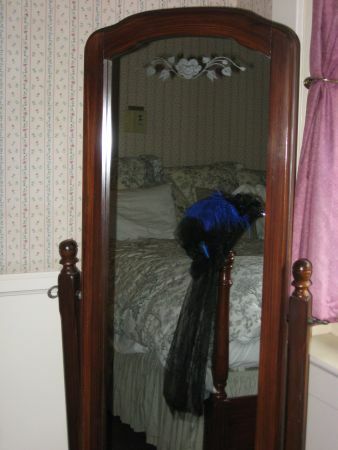 There was a small sitting room with an armoire and a settee. 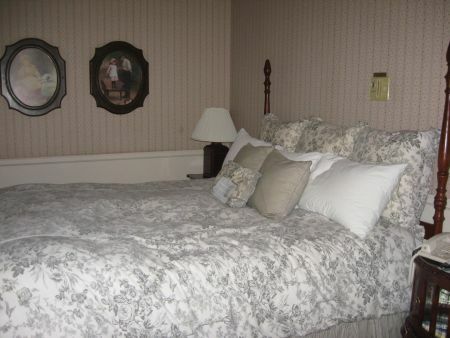 The bed and the television, were in the middle room with a bathroom on the other side. This meant the bed-wall was never connected to another room with people in it. Very well thought out! Some Victorian wallpaper can be overwhelming, but most hotel decorators have figured out to go with the smaller prints, like rows of flowers. The bed was high, very comfortable, and the temperature was good. The room was perfect, and a front row seat on the next days’ festivities. This entry was posted in View from the Road and tagged Depot Park, detelicts, Handcar Regatta, Hotel la Rose, Santa Rosa California, Victorian Hotels. Bookmark the permalink. This reminds me of the River Street Inn in Savannah. I love the well taken care of historic hotels. They are really special. I didn’t know that you stayed at the Hotel la Rose for the Regatta – how cool is that! You are so good to yourself. I need to take lessons. Thanks for showing pictures of the room. I always wondered how the rooms were – lovely! I remember those bad days. You did a lovely job restoring it. It definitely anchoring the reinvigorating of Railroad Square. Thank you, I appreciate your comments. I do have to correct myself, work was done in 1984 it was opened in 1985. I was 23 years old. I lived on site in Santa Rosa for three and one half months and did hard hat tours for the public during construction. There are jewels of information I have on the place. 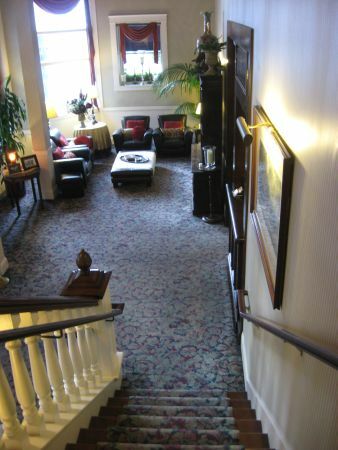 For instance, the newel post at the base of the stairs in the lobby, pictured in the article above, is from the original cable car depot in San Francisco. They were gutting the place and auctioning pieces of it off. 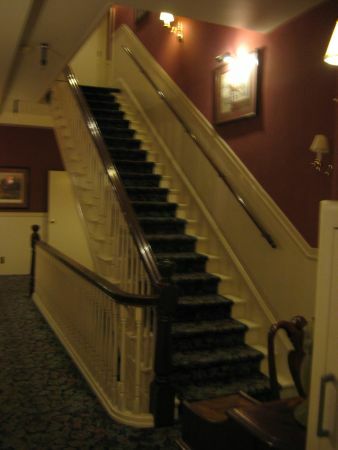 We purchased two newel posts and brought them to the hotel. I am glad so many people enjoy the place and from the photos, it appears the lovely, old rose color I chose for that tall lobby ceiling, is still in place, as are many of the original wallpapers and some furnishings. My budget was almost a half a million and I came in 45k under budget. 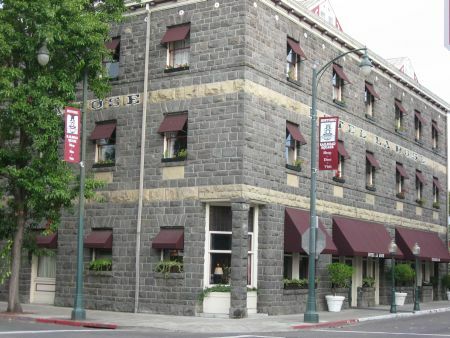 That included the annex and the additional bar and grill across the street, the original railroad warehouse for Korbel. I would love to make a trip up there again and show my daughter who is in her twenties.